Have you been wondering how it would feel to have a beautiful healthy smile? If your answer is yes, then you have come to the right place! 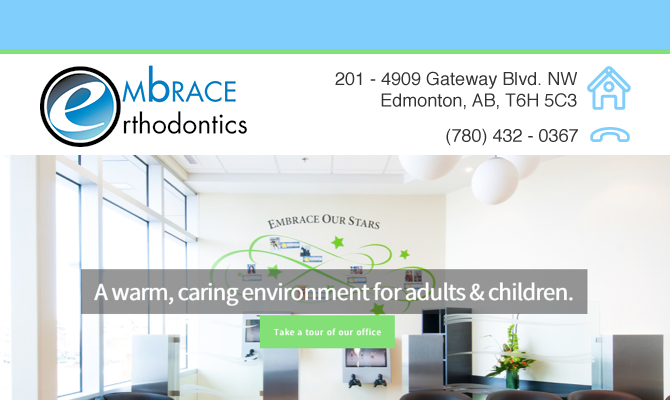 Edmonton, Alberta, based Embrace Orthodontics can help you to achieve just that: the smile that you have always dreamed of. A perfect smile helps you to exude confidence and success, both personally and professionally. It also improves your health and overall well-being. Let our expert team transform your smile! Take the next step toward that perfect smile! When it comes to orthodontic care, it is very important that you choose the right orthodontist. Good rapport and understanding of your or your family’s needs is of utmost importance. Dr. Sileikyte and her team at Embrace Orthodontics is dedicated to providing you with personalized care that meets and surpasses your expectations. We understand the importance of being confident with your smile while undergoing treatment. We offer a wide variety of esthetic treatment options, including the modern self-ligating appliances, invisible ceramic braces, custom designed Incognito® lingual braces and Invisalign®. Dr. Sileikyte is also proud to offer Accelerated Orthodontics (Wilckodontics®) which is a wonderful option for those interested in being out of treatment in less than 10 months. Embrace Orthodontics – your best choice for a better and healthier smile! At Embrace Orthodontics, we enjoy working with patients of all ages: children, teenagers, and adults. We welcome you to join our family, Embrace Orthodontics family, and embark on a wonderful journey towards the perfect smile that you always wanted! Contact us today to schedule your initial in-depth consultation. Dr. Ramune Sileikyte and her dedicated team of highly-qualified, friendly professionals will be happy to help!